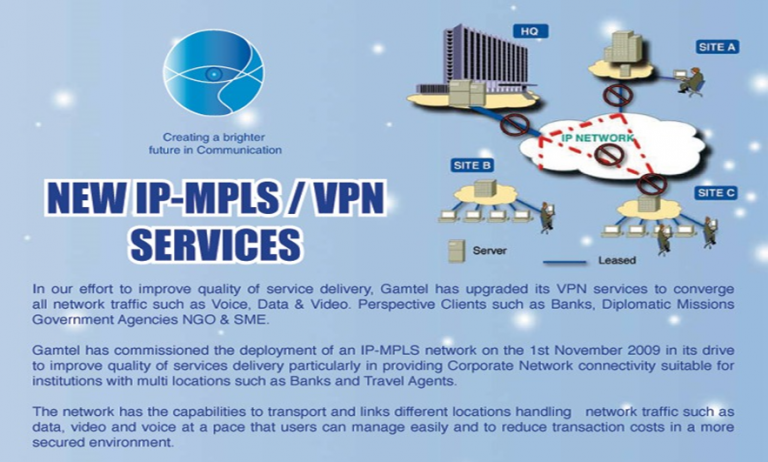 Gamtel IP-MPLS /Virtual Private Network (VPN) service provides a fully meshed end-to-end network between locations, which allows businesses to connect to their corporate server wherever they are. Our IP-MPLS/VPN service enables users to share bulk file, video conferencing and similar network services through stable, secured and state-of-the-art fibre optic with countrywide backbone coverage. VPN with internet allows businesses to transport valuable information over secured VPN network to different locations, while simultaneously access internet for email, downloading files, online streaming etc. VPN only allows businesses to transport valuable information over secured VPN network to different locations.